Another branded Monopoly slot comes from SG Interactive and Bally, this time enhanced with the Hot Shot games offering additional chances of winning. Monopoly Hot Shot is a 3-reel 27-payline slot machine themed on the popular game and offering a networked progressive jackpot and three local jackpots. The game is available at land-based casinos. Monopoly Hot Shot features theme-related symbols depicted as the game tokens including top hats, boots, race cars, thimbles and so on. Rich Uncle Pennybags also makes an appearance on the reels assuming the role of Wild along with the Scottie dog that triggers the main attraction of the game – Board Game Bonus. We hope this game will make its way to online casinos as well. Meanwhile you can enjoy other Monopoly themed slots online: Bring the House Down, Once Around Deluxe, Big Event (with 99% payout) and the classic Monopoly slot machine. If you like classic slots with a twist, Monopoly Hot Shot is a game for you. This action-packed release will keep you spinning the reels thanks to its multiple bonus features including game-in-games that can award one of four progressive jackpots. Those who like playing Monopoly will adore it too for its Board Game Bonus providing players with a realistic gaming experience. Monopoly Hot Shot boasts amazing graphics for a classic slot machine and you will love it from the moment you stat playing the game. Another feature that makes the Ballt title so attractive is a set of no less than 4 progressive jackpots on offer. The three local jackpots can be triggered by spinning the reels of the mini-reelsets within game-in-games triggered by scattered special symbols. 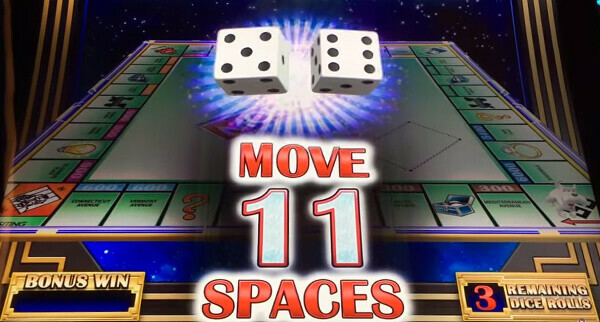 The mini-games included in Monopoly Hot Shot are Action 777, Luxury Diamond Line and Triple Diamond Go. As we have previously mentioned, the biggest attraction of the game is the Monopoly Board Game Bonus feature offering multiple opportunities to win. It is triggered by landing three Scottie Dog symbols anywhere in view and you have to roll the dice to make moves on the game board. Different positions award different prizes including multipliers, additional features, credit refunds and cash payout. One of the biggest downside to the Bally release is in the fact that it can be played only at land-based casinos. That means that the game is available only to those players who can afford visiting a brick-and-mortar casino offering Bally cabinets. If you are one of them, you may find the game a bit complicated with all bonus games incorporated in it. 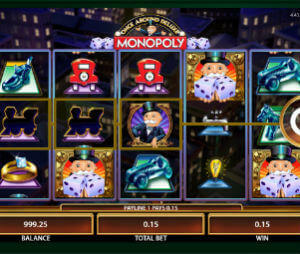 Monopoly Hot Shot has a lot going on and if you like slot machines packed with bonus features, you will love this one. However, those who prefer playing slot machines on their desktop and mobile devices will have to wait for the game to be adapted for online and mobile play. All Monopoly fans can give a try to other slots based on the game that is popular worldwide. Instead of driving other into bankruptcy, you can leave with pockets full of cash.